Currently, I am wrestling with water restrictions imposed by Barton Water Cooperative. My area is in a drought. Yet, so, I have green grass in all my fields for I have not allowed over-grazing by neither horses nor cattle. 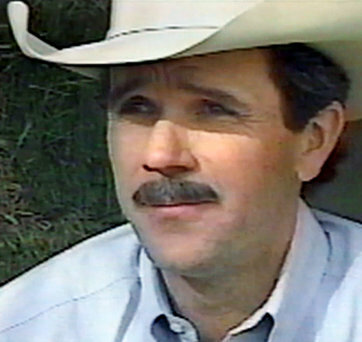 Kirk Hanna sought to employ a holistic environmental approach to cattle ranching. His struggles are detailed in this documentary, “Hanna Ranch.” See also the link within the article to the Holistic Resource Management site, originating on the savannas of Africa. See more on the New York Times link. ‘Hanna Ranch’ Wrangles With Environmental Issues – NYTimes.com. To give you an idea of the extent of the Possum Kingdom Complex Fire, here is a map with pertinent marks. The distance legend is at the bottom as well as the location of our place — “Matthews (Flying Hat).” The green lines indicate the field observations I have made the last few days — going north from Flying Hat on SH 108, SH 919 to US 180, then east and west to the Stephens County line, then southward along SH 16 to Strawn. Wildfires were observed yesterday, NORTH of US 180 and WEST of SH 16 to Strawn — thirty-six miles of the sub-route. Many of those were fire spots that were lessening in intensity. The temperature this morning at the Matthews Place is 65 deg., humidity is 20 percent. In looking at the National Weather forecast, there were NO Red Flag Warnings for today! I will be writing a post later today. With a click of your mouse, you may enlarge the map for obligatory detail. 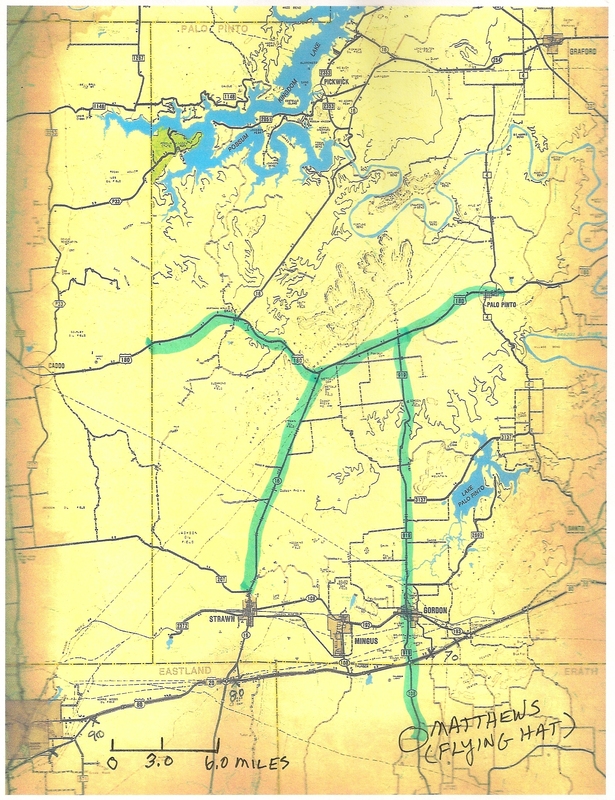 Matthews Place north to Possum Kingdom Lake (The Roads of Texas map set, 1988). 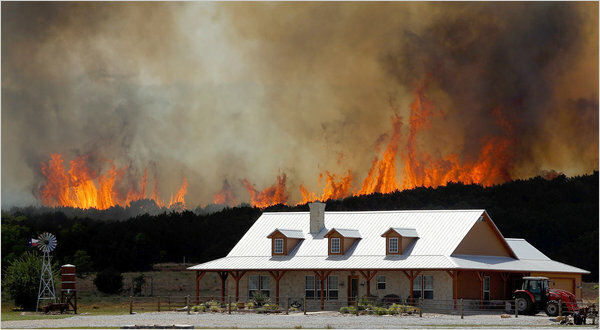 Wildfire near Strawn, Texas (photo by Tom Pennington, New York Times, April 20, 2011). Corrections: italics used to emphasize and word added that these were observations made yesterday. Large caps used to indicate NORTH and WEST in locations. Sentence added that some hot spots were lessening in intensity yesterday. I drove thirty-six miles this afternoon along SH 919, US 180, SH 16 and there was fire and smoke, large plumes of newly-erupting fires and smoldering cedar trees emitting smoke across the highway like a fog. I wish it was a fog. 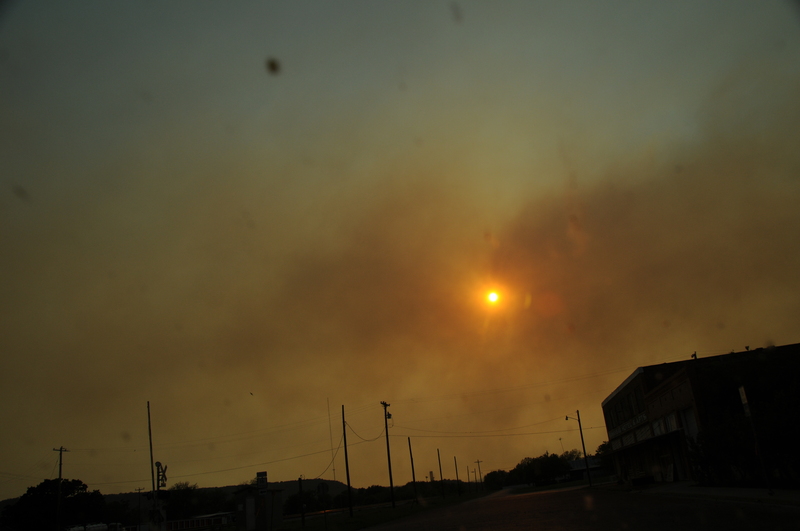 Ashes fell out of the sky, the wind blew steadily from the north, a welcome change of sorts that turned serious for Palo Pinto, Texas. Thirty-six miles I drove and saw this fearful landscape and that was only the southern perimeter of the Possum Kingdom-Palo Pinto Complex Fire. Some of these areas are still burning from days ago. Fire crews with red lights turning appeared all along the highway. Game wardens entered ranches to warn inhabitants. Farmers and ranchers unlatched their gates along the route to Palo Pinto to allow crews to enter. TV crews and their satellite vans were set up — NBC, CBS, ABC and others. Everywhere I looked on the thirty-six mile southern perimeter there were plumes of smoke and fire like miniature volcanoes in the gullies and along the hillsides. I have traveled the same circuit for several days and the smoke still rises about the countryside. I came home and found messages from our Co-op water company. Our water Co-op, Barton Creek Water Cooperative, left two urgent messages one hour ago to stop using water except at a minimum. The Possum Kingdom Fire Complex is currently draining the Gordon Water Supply Cooperative and they have terminated water connections for us on Barton Creek Water Cooperative. We are ordered to restrict or terminate usage and haul water for our livestock. We are to be conservative in usage at the very most. Power poles have been destroyed in the fire and the electric company has cut off power to the Gordon Water Supply pumps. Gordon is six miles north of us. The outlook is grim if our area does get any rain and more water restrictions may occur. Here on our place we have a large stock pond that is down in elevation, but has plenty of water for Star and other livestock. I have offered to place several horses and cattle on our place since the stock tank is large. I have a small well, but the water is not potable for animals and humans, but we may use it to water plants. We have filled up our two bathtubs and collected water in pitchers, jars and crock pots. The Co-op has just called — 8:55 p.m. — and said that the water restrictions will probably be temporary, but again stated to be conservative. Late this afternoon, Palo Pinto, a town north of us some twenty-five miles, has been ordered to evacuate since the winds have shifted from the north. A large jail is being emptied and prisoners transferred to other units. 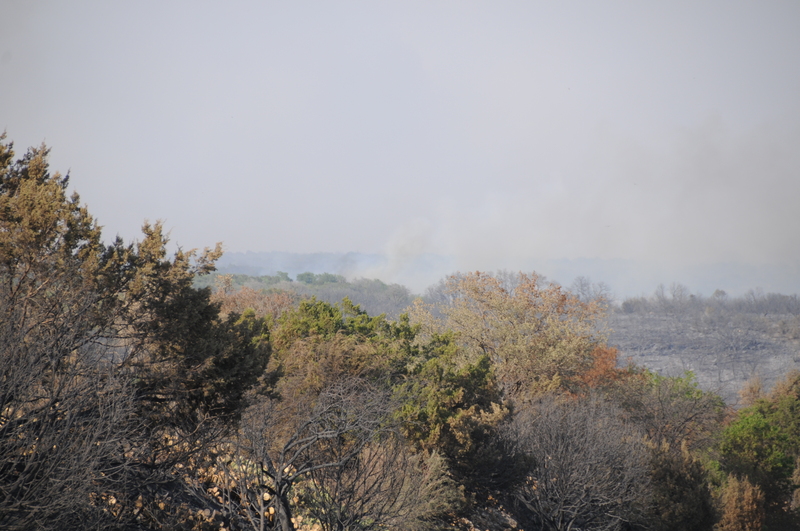 The fire jumped the Brazos River and the fire crews have concentrated at Palo Pinto, the county seat of Palo Pinto County. Before the cold front came through in late afternoon, my thermometer registered a high of 109 deg., but settled at 103 deg. for a couple of hours with a humidity at nine percent. The winds have died down after dark and we are preparing for bed. Weather forecasts tell that rain may fall tomorrow night — scattered showers, but we’ll take it. Here are some photographs I took this afternoon at the SH 16 and US 180 intersections and a few other places as captioned. With a click of your mouse you may enlarge and find the obligatory detail in these matters. Dead broomweed from last season that is tinder for a spark. This field is on the road to Palo Pinto, Texas, along US 180. A round-up of cattle in holding pen for transfer in case fire comes, on SH 16, north of Strawn. Crews and trucks assembling for the dash to Palo Pinto, Texas. This is at the intersection of SH 16 and US 180. Possum Kingdom is eight miles away in the background. Possum Kingdom Complex Fire, southside of lake. 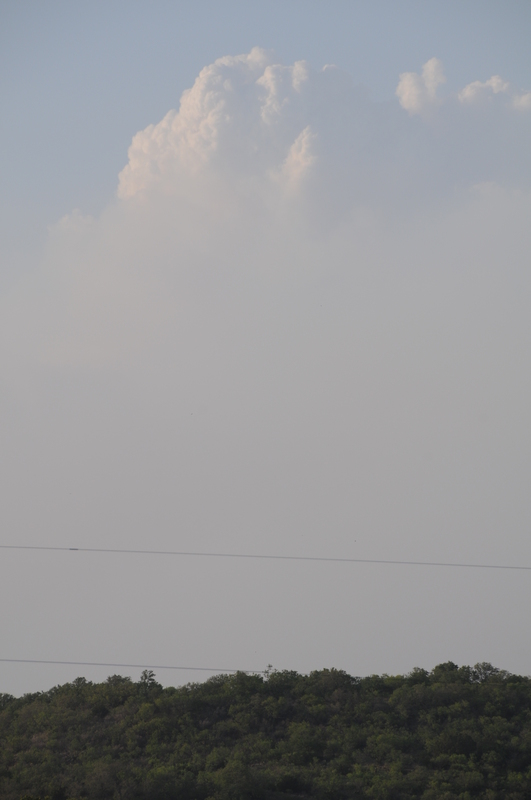 It is not likely that rain will fall out of this cloud, but I can’t predict the weather. I write and I photograph. 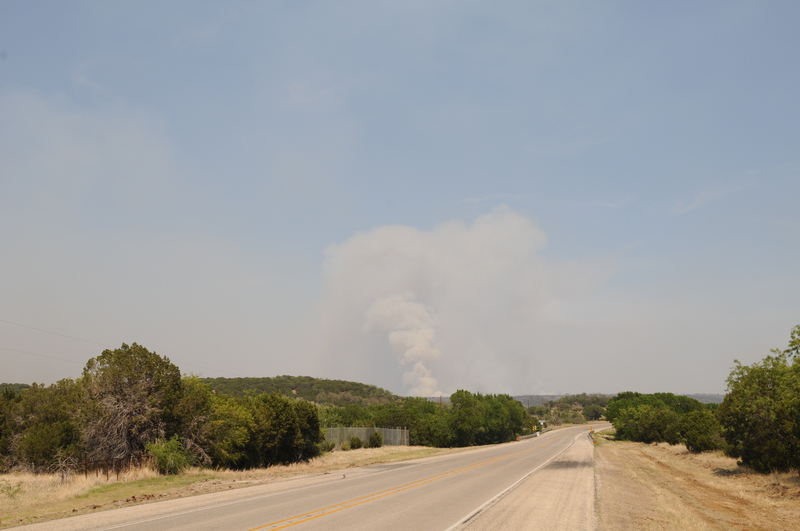 At about 2:00 p.m., CDT, I drove on the south side of Possum Kingdom Lake and photographed the ignition of fires on the west side of SH 16, north of US 180. Please see my previous post for the photographs. The smoke clouds began to rise and extend heavenward beyond what I could imagine. 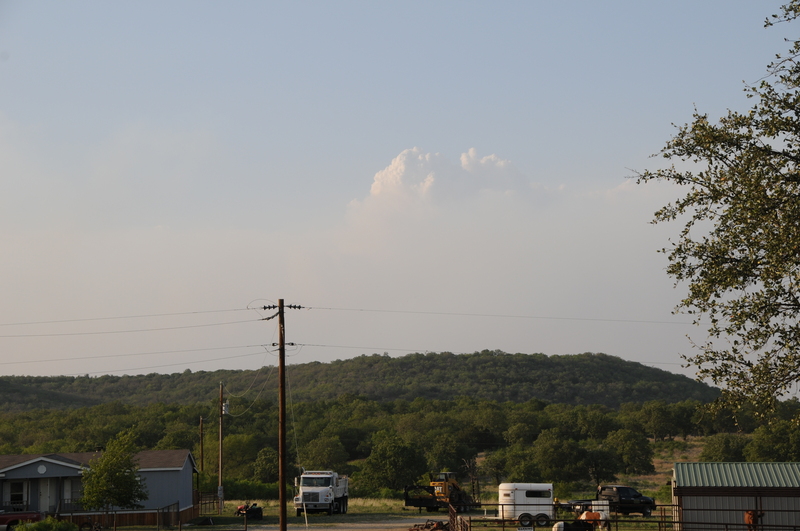 Thirty-minutes ago at 7:00 p.m., from my front pasture, maybe twenty-thirty miles away, I shot the following photograph of cumulus clouds that had arisen from the fire five hours ago over Possum Kingdom. The photograph is not artsy, but documentary, and signifies a correlation of natural forces that are comprehensible, yet in the narrative of this terrible tragedy cannot be understood. 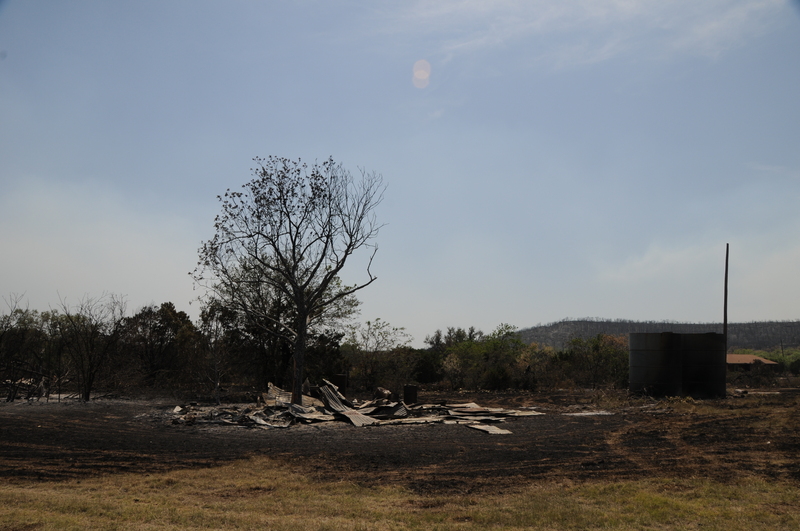 From the anguish and death of this Possum Kingdom fire, clouds form out of dust and ashes, rising so high they become cumulus. On other days, they might of yielded rain to parched pastures in Texas and Oklahoma. The connection between destruction and creation is just confusing right now, but it is how things are. Out of fire, a cloud, perhaps rain. This is the photograph without the telescopic lens. I am looking north from our place in north Erath County across the Nowack ranch where they have set up vehicles for evacuation if necessary. Corrections applied to third and fourth paragraphs, breaking up several compound sentences in original publication. It’s an imperfect world and so are fourth drafts. After transferring items between two trailers here on our place, I ate a ham sandwich and departed for the northern part of our region, up SH 108, FM 919 through Gordon and up to US 180, approximately twenty miles away. I turned west on US 180 and drove to the Stephens County-Palo Pinto County, Texas line. I had not driven farther two days ago than the SH 16 highway intersection. The magnitude of this fire stuns me. From Ioni Creek to the Stephens County line on US 180, about ten miles or so, the country is blackened and hot spots still smolder in the hills. As I approached the intersection of US 180 and SH 16, I looked out the window of my F-150 and saw the beginning of a huge fire eruption at Possum Kingdom East. Click the photographs with your mouse to enlarge and get detail. 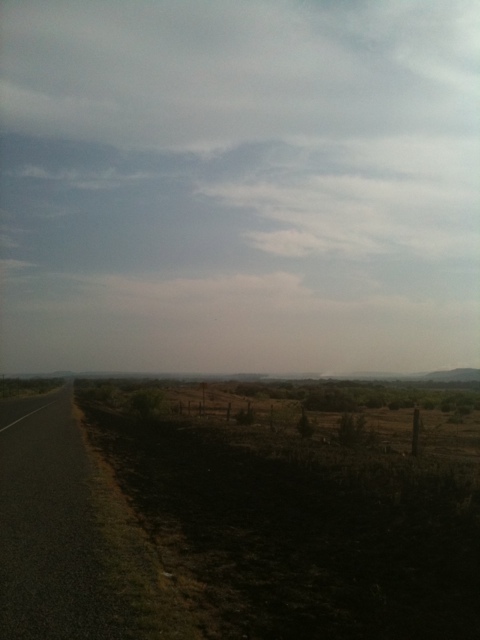 Looking north from US 180 near intersection of SH 16, PK East Fire. I drove farther from the SH 16- US 180 intersection — Highway Patrol blocked SH 16 north — and saw blackened countryside all the way to the Stephens County line. I turned around and came back down US 180 and here is a shot of the smoke cloud. Smoke cloud of PK East Fire on US 180 headed east back to SH 16 and Strawn. I saw at least ten fires — not counting the hot spots — along US 180 and SH 16. Rio Vista, Joshua, Granbury and other volunteer units were scattered along the highway. 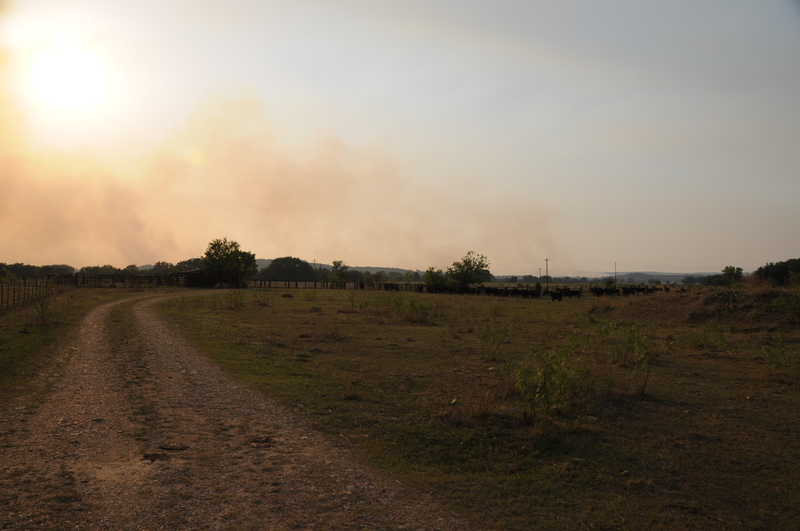 With the outbreak of at least two fires northwest of Strawn, I saw the Cunningham Fire Department go into a ranch, led by the rancher and authorities. Through-traffic in Strawn is prohibited and I cut across the country, using Davidson Cemetery Road to get back home. 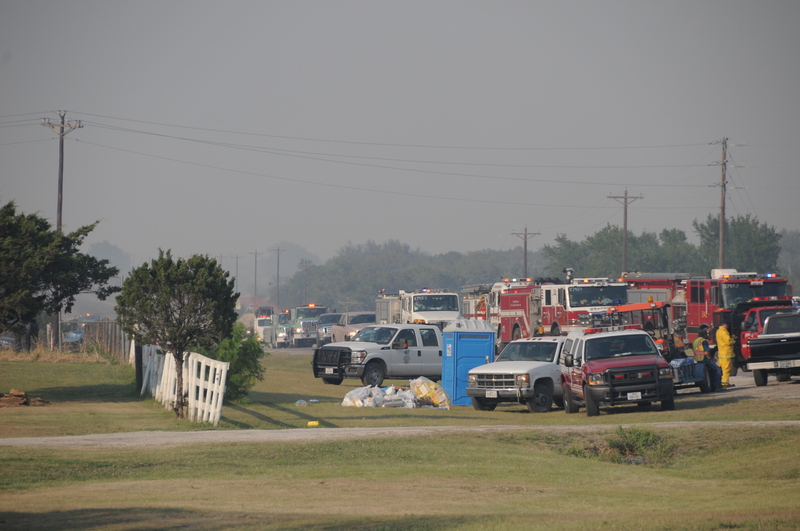 Highway 16 in Strawn is scattered with vehicles and fire trucks. I don’t like disaster-pandering posts. I think they are bad form and take the mind away from applying its powers to correct defects that caused disasters in the first place. Tours of Chernobyl are disgusting. These events in my region — I am about fifteen-to-twenty miles south from the fires that have gone on for days it seems to me — are uncommon. I’ve lived most of my life in Texas, in this region, and I’ve never seen fires like this. My immediate surrounds in north Erath County are green and we’ve been fortunate. Mingus, my mailing address, and Gordon, six-miles away, were ordered to evacuate several days ago. As soon as these events are over, I will be glad to post on verbena and milkweed. Tomorrow the Fire Weather Watch forecast is worse. Today, it’s 100 deg. and wind at 20-25 m.p.h., humidity low. If it gets worse, I won’t go to teach in Abilene, but stay here and monitor the place. Burned structures at US 180 and SH 16. Field report and photo by iPhone (kind of slow to thumb a post). Smoke and hotspots. Looking south on SH 16 in the direction of Strawn. 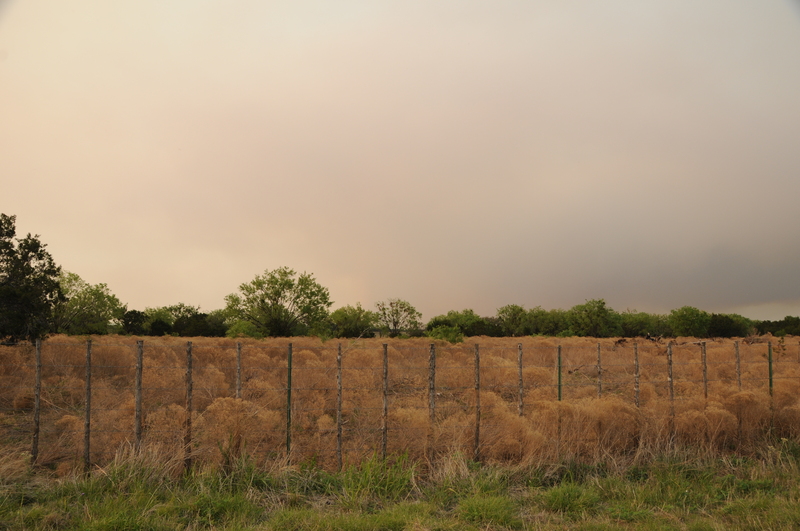 Palo Pinto County, PK East Fire – The entire city of Strawn (pop. 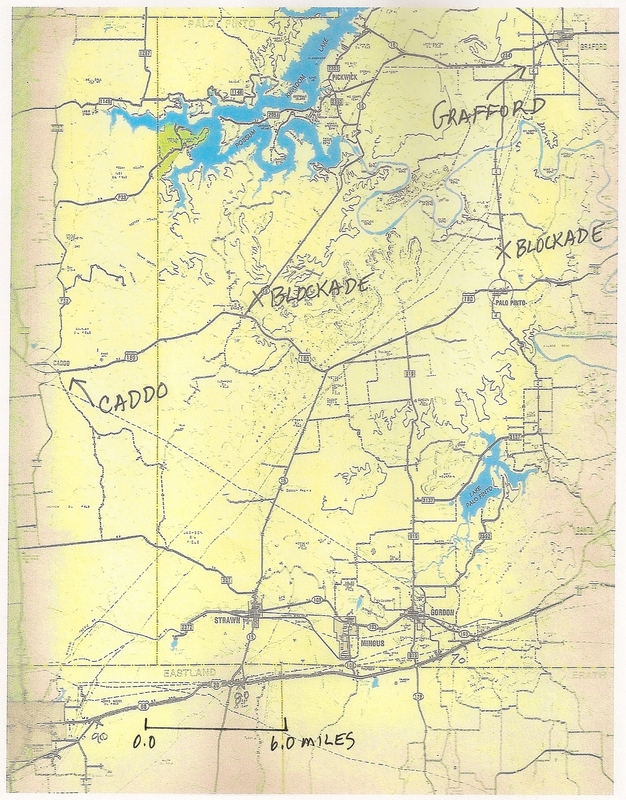 764) and portions of Palo Pinto County, described as areas west of Highway 16 and south of Possum Kingdom Lake, are being evacuated. An evacuation order has been given for the Peninsula on Possum Kingdom Lake. The Peninsula has approximately 300 homes and a campground. Fire is estimated at 1,000 acres. I went out this morning to view and photograph the Possum Kingdom Lake wildfire event. I was not able to see Possum Kingdom Lake because I do not have press credentials and State Highway 16 was blocked at the intersection of US 180. Today the winds are calm, but tomorrow afternoon a Red Flag warning has been issued for west-central Texas. I drove the F-250 from our ranch north of I-20 on SH 919 to Gordon, cut west along the Schoolhouse Road north of Gordon to St. Boniface Catholic Church on Dodson Prairie. The elk behind the high field fence on the Guest Ranch appeared unharmed. After driving by St. Boniface, I turned north on SH 16 and journeyed to US 180, turning west and headed in the direction of Possum Kingdom and Breckenridge, Texas. As I ascended the small mountains about Ioni Creek on US 180, I saw blackened trees and fence posts that had burned last night. The pasture lands were turned to cinders, but I saw no livestock affected. 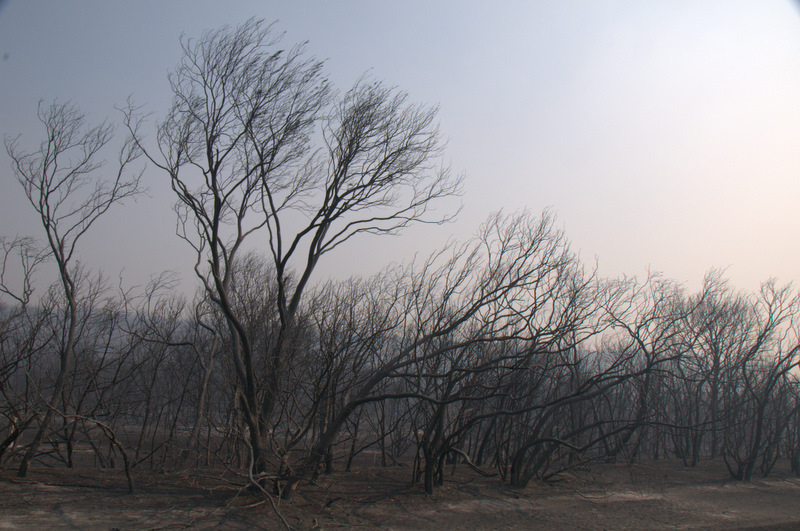 Hotspots of fence posts and erosion barriers emitted smoke and flames. Towards Possum Kingdom Lake, the Highway Patrol blockaded SH 16, and after a few more miles going west on US 180, I turned around and started back to the ranch. I turned south on SH 16 towards Strawn, past Schoolhouse Road and St. Boniface and then realized why the Texas Forest Service and state officials had ordered an evacuation of Mingus and Gordon last night. The fire last evening had leapt the highway and was headed southwest towards the two villages. 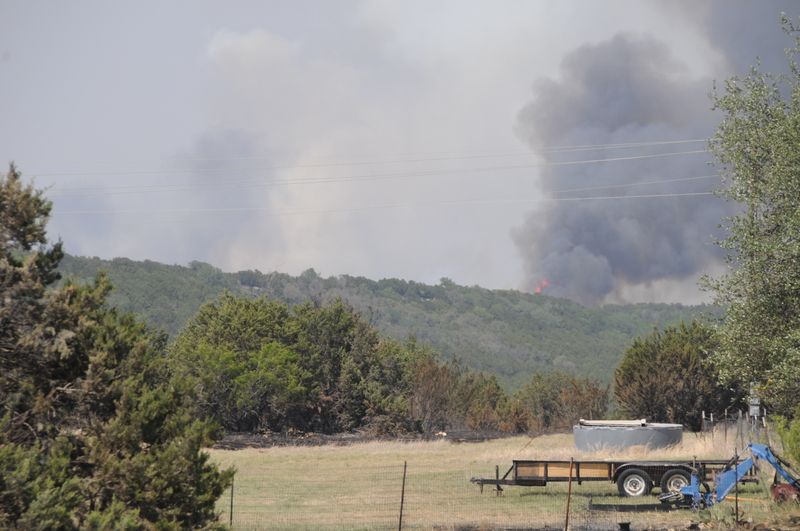 The Forest Service, Brazos Volunteer Fire Department and the Lone Camp Volunteers (other volunteer departments were also involved) had stopped it last night, but the frontline of combating it today and tomorrow was east of SH 16, about six miles north of Strawn. The Texas Department of Public Safety and Forest Service set up command posts in Strawn. The winds tomorrow are forecast out of the south at 25 m.p.h. so the winds will carry any fire to the north and east. The Possum Kingdom Lake fire will not affect us. We will wait and see what else transpires when the dry line (nicknamed the Marfa Line) passes by tomorrow afternoon, lowering the humidity. Our ranch lies south of I-20 and we will be prepared for any outbreak of fire in our area. That means that we have trailers hitched, grass and lawns watered and the dogs ready to go with Star, our paint gelding. With the exception of the sunset photograph, I have the photographs arranged in the order I traveled and time that I shot the pictures. When I came back to the house, I had to take off my coat and leave it in the utility room because it stank of smoke. Correction: the church is St. Boniface, not St. Alban. Changed verb conjugation: leap, leaped, leapt. All photographs were taken NEF, uploaded JPEG. NEF file sizes ca. 10 megs., a digital negative.